It is my deep love for my constituents and the Maryland Senate, combined with a recognition that I can no longer serve with the strength and energy you all deserve, that I have decided the time has come to turn the mantle over to a successor. . . I was proud and supportive when Rev. Shirley Gravely-Currie courageously put herself forward to fulfill this role as no other person came forward without the intention of using the appointment to gain an election advantage over others. Since my announcement, it has been nothing but petty political jockeying and deal making, with only the 2018 election in mind. Claiming to be shocked at the role that politics plays in politics and at the loss of civility his departure from the Senate would mean, Currie made a political move. As his resignation was not yet effective, I imagine he will make it stick. While Currie certainly is a courtly individual, the Senate voted to strip him of his leadership position as Chair of the Budget and Taxation Committee in 2010 for ethics violations. Even Currie voted for the motion, which took place in the wake of his being found not guilty on bribery charges. Having announced his departure, Currie should go. His behavior makes him easily characterized as a member of a crony driven pay-to-play Annapolis elite. Reversing his resignation for health reasons because his wife couldn’t win the appointment only serves to increase political cynicism. I know little of his potential replacements but it would be good for the Democrats and for Prince George’s for someone new to be given a chance to represent the district. With an appointment for the District 20 Senate seat approaching, the time is right to revisit the issue of whether to have special elections for General Assembly vacancies. David Lublin and I have been writing about this for nearly a decade, but the issue will not die. Under the state’s constitution, when vacancies occur for State Senate and Delegate seats, special elections are not held to fill them. Instead, the county Central Committee of the same party as the seat’s former occupant must submit a name of a successor to the Governor within thirty days, after which the Governor appoints the new legislator. If the Central Committee does not meet the thirty day timeline, the Governor has fifteen days to appoint a successor from the same party as the person formerly holding the seat. If the legislative district covers more than one county, each county Central Committee can send a name with the Governor deciding between them if they differ. The bottom line of the process is this: under most circumstances, the county party Central Committees, who themselves are elected in party primaries, have effective appointment power over these vacancies. And they use that power frequently. In 1998, Montgomery County voters approved a charter amendment providing for special elections for County Council vacancies with 90% of the vote. Montgomery was the second county in Maryland to have special elections for Council Members since Prince George’s already had them in its charter. In 2004, Howard County voters approved a charter amendment providing for special elections for County Council vacancies with 88% of the vote. In 2014, Maryland voters approved a statewide constitutional amendment providing for special elections for County Executive vacancies with 81% of the vote. The amendment did not require special elections, but it did allow county charters to be amended to allow them upon approval by voters. In 2016, Maryland voters approved another statewide constitutional amendment mandating special elections for Comptroller and Attorney General vacancies. Prior to the amendment, vacancies in those offices were filled by gubernatorial appointment. Seventy-three percent of voters supported it. Also in 2016, voters in Montgomery and Wicomico Counties voted in favor of charter amendments allowing special elections for their County Executives, which were made possible by the 2014 state constitutional amendment. The charter amendments received 90% of the votes in Montgomery and 75% in Wicomico. Wicomico voters also supported a charter amendment for County Council vacancies with 77% of the vote. With such overwhelming support among voters for special elections, why aren’t they used for state legislator vacancies? Some lawmakers, including Senators Rich Madaleno, Jamie Raskin and Brian Feldman and Delegates David Moon and Christian Miele (a Republican), have tried to pass constitutional amendments providing for them in various forms. Moon’s 2015 bill had bi-partisan support from very progressive as well as very conservative legislators. But officials from both parties always oppose these bills because they strip power from Central Committees and they teamed up to help kill Moon’s bill last year. Most of the time, appointees serve about as well in the state legislature as those who are elected, but there are exceptions. 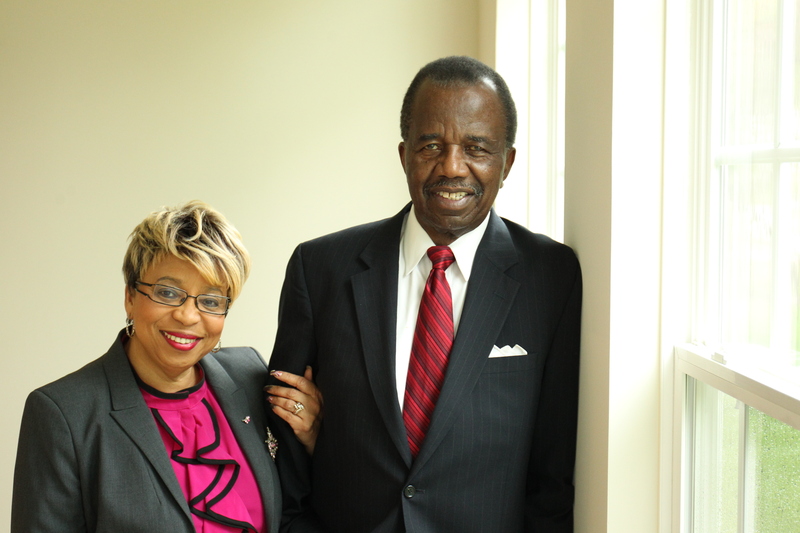 A glaring example is the District 24 (Prince George’s) appointment in 2013. Incumbent Delegate Tiffany Alston was removed from office and the Prince George’s County Democratic Central Committee recommended Gregory A. Hall to replace her. But Governor O’Malley refused to accept the appointment because Hall participated in a shooting incident resulting in a murder years ago. O’Malley instead appointed former Delegate Darren Swain to the seat. A year later, Swain was victimized in a bizarre beating and car-jacking in which his assailants accused him of using drugs with them and groping one of them. Alston, Hall and Swain all ran against each other for Delegate in 2014 and all of them lost. This issue might not be such a big deal if appointments were rare, but they happen all the time. Ten of MoCo’s 32 state legislators – four Senators and six Delegates – were appointed to a seat at some point in their careers. That number will go up to eleven or twelve depending on what happens in District 20. Let’s be clear. We do not intend to imply that these appointed lawmakers are bad elected officials. In fact, some of them have turned out to be excellent. But when voters don’t get to pick more than one third of the people who represent them, something has gone badly wrong. Gerrymandering is often criticized because it allows politicians to pick their voters. Legislative appointments might be even worse because they allow politicians to pick other politicians. And the power structures of both parties endorse this even though gigantic majorities of their rank-and-file oppose it. The survival of special elections after all these years prompts us to ask a question of all state policy-makers. What’s more important? The prerogatives of party officials? Or the rights of the voters? Meet the New Liquor Monopoly. It’s the same as the Old Liquor Monopoly, except with less accountability. OK, now that the applause is dying down, let’s look at the details. The New Liquor Monopoly proposed by County Executive Ike Leggett would be a quasi-governmental authority rather than a county department. It would have the same warehouse, the same equipment, the same trucks, the same ordering and billing systems, the same employees, the same front-line and middle management, the same union and – of course! – the same state-sanctioned monopoly status. This is “change” that only a monopoly would love! But wait. There is one significant difference. 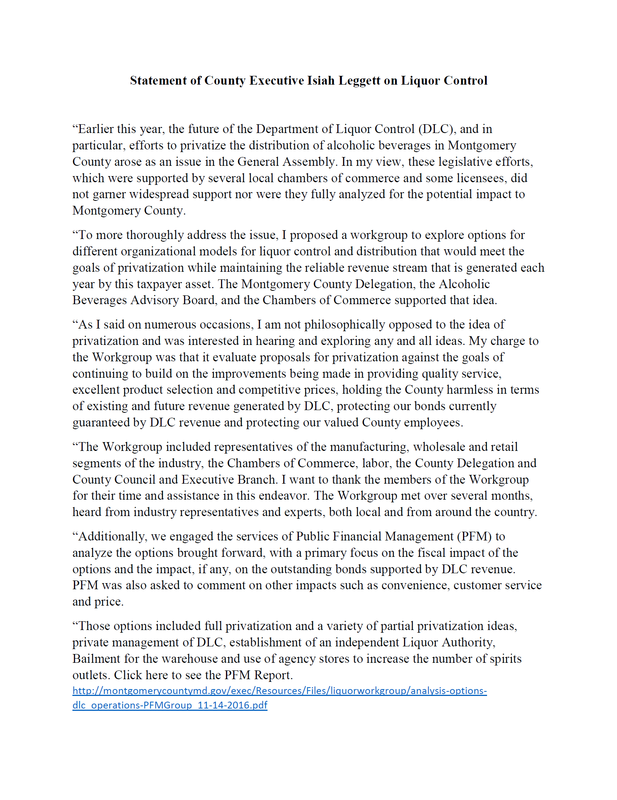 Under the current system, the Executive Director of the Department of Liquor Control (DLC) is a department director who serves at the pleasure of the County Executive. Should the Executive become displeased with his or her performance, that person could be dismissed. The County Council has a role (at least hypothetically) in holding DLC accountable through its power to approve DLC’s operating and capital budgets as well as any debt secured by liquor profits. Those sources of accountability disappear in the New Monopoly. The proposed authority would be governed by a Board, which would be nominated by the Executive and approved by the County Council, and that Board would hire a CEO. The CEO would not report to the Executive. The council would no longer have approval authority over the New Monopoly’s operating or capital budgets. The New Monopoly would also have unfettered authority to issue debt. Here’s a question, folks – what do you think will happen to liquor prices if the New Monopoly screws up and takes on too much debt? Pish posh – it’s not like the existing Monopoly has ever screwed up, yeah? We know you can barely contain your excitement. 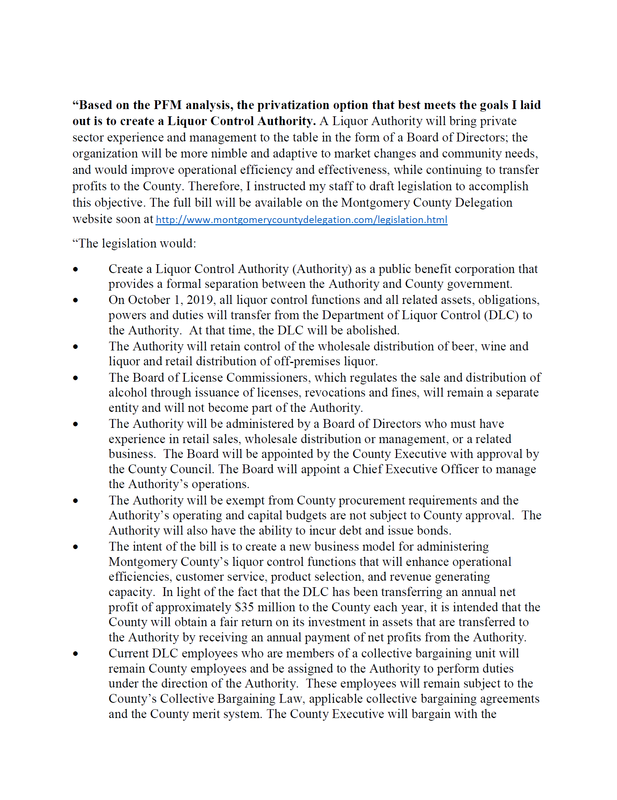 Here is the County Executive’s statement so you can absorb all the dirty details! At first glance, the New Monopoly is little different from the Old Monopoly. From top to bottom, it is the same entity in terms of capital, labor and processes. But this new beast could be much more dangerous than the old one. It is neither accountable to its customers nor to elected officials. In fact, it is accountable to no one at all. Folks, it’s time for brutal honesty: our county government has failed us. The liquor monopoly’s problems have been apparent since the first year of the current County Executive’s first term. For nine long years, the county did nothing as the monopoly continued to get worse, culminating in the epic 2015 New Year’s Eve disaster. Thousands of consumers and licensees signed a petition to End the Monopoly and residents even voted for term limits in part due to fury over DLC. And what do we get? A proposal for Endless, Unaccountable Monopoly. We, the residents and business owners of this county, have not been heard. Our demands for freedom have been subjugated to the crushing burden of alcohol totalitarianism. There is only one thing left to do. Vote for candidates who will End the Monopoly in the next election. My guess is that Trump is merely trolling Mitt Romney and Nikki Haley by meeting with them in the wake of the election. He enjoys the spectacle of them coming to kiss his ring but is way too narcissistic to appoint anyone who has been critical of him. Having said that, Mitt Romney would be a fine choice for Secretary of State. I support Romney not in spite of his being a conservative but because he is one. Romney labelled Russia as a “geopolitical foe” — a regretfully accurate description in the wake of Russian aggression in Ukraine and Syria. Romney has been willing to take on Trump over his coziness with Putin. This will be needed in light of Trump’s willingness to let Russia dictate American foreign policy (e.g. we can’t support the rebels in Syria because Russia wouldn’t like it) and his naming of Michael Flynn–an abrasive man with close business ties to the Russians–as National Security Advisor. The economic rise of China and other countries across Asia poses a different type of challenge. China and the rest of Asia are on the move economically and technologically. They are a family-oriented, educated, hardworking, and mercantile people. Trade and commerce with these huge new economies can further strengthen our economy and propel our growth. If America fails to act, we will be eclipsed. We have to keep our markets open or we go the way of Russia and the Soviet Union, which is a collapse. And I recognize there are some people who will argue for protectionism because the short-term benefits sound pretty good, but long term you kill your economy, you kill the future. This doesn’t mean that Romney supports unfair trading practices on the parts of our partners. But it does mean that he recognizes that trade is critical to American economic success and an important part of our future–a welcome approach in an era when this has gone out of style in both major parties. In short, Romney’s basic approach resembles that far more of Hillary Clinton than Donald Trump. He would be a welcome sign of calm as the election results have created deep concern among our key allies and partners around the world. While I’m grateful to the supportive friends who have urged me to consider running for DNC Chair, I will not be seeking our Party’s Chairmanship. The DNC needs a Chair who can do the job fully and with total impartiality. The national interest must come first. The election of Donald Trump has upended much of Gov. Larry Hogan’s reelection plan for 2018. Midterms are usually hard on the president’s party, which would have been great news for Larry Hogan except that Hillary Clinton didn’t win the election. An examination of periods of unified party control of Congress and the Presidency since 1990 does not augur well for the Republicans. After Bill Clinton’s 1992 victory, Republicans swept in and took control of both the House and the Senate in 1994. In the wake of 9/11, George W. Bush proved an exception, as the Republicans held up well in 2002. However, Democrats swept back into control in 2006, taking both the House and the Senate despite the structural barriers faced by Democrats in both cases. Republicans also well remember that they eliminated the sizable Democratic majority in the House in 2010, just two years after Barack Obama gained election and ushered in unified Democratic control. While Republicans didn’t take the Senate, they made major gains, and the GOP took control of that body in the next set of midterms in 2014. Democrats face enormous barriers to Senate gains in 2018 because they already hold so many of the seats up for election. However, the Republicans will likely face much less favorable trends than this year and this structural advantage won’t aid Larry Hogan. Indeed, a close examination of gubernatorial elections during midterms held under unified federal control by one party should not give Larry Hogan much comfort. Republicans made stunning gains in 1994, as they picked up a walloping 10 governor’s mansions. They held the chief executive spot in 30 of the 50 states after this banner year election. The post-9/11 2002 elections were less of an exception to the rule in gubernatorial than federal elections. The Republicans lost seats, though Bob Ehrlich did pick up the governor’s mansion in Maryland to become the first Republican since Spiro Agnew in the 1960s to hold that office. The 2006 midterms were a great year for the out party–the party that did not hold the presidency–as Democrats went from a minority of 22 state houses to 28 after the elections. Gov. Ehrlich lost reelection in Maryland. As the out party in 2010, Republicans reversed that trend. They went from having a minority of 23 governorships prior to the election to 29 afterwards. Yet Ehrlich, trying for a comeback, lost by an even greater margin to Gov. O’Malley. In 2014, despite already holding 29 governors, the GOP managed to pick up two more for a total of 31. Something new happened in the U.S. Senate elections in 2016. Not one state elected a senator different from the party of the presidential candidate that won that state. This caps a long downward trend in the number of congressional districts that split their ticket. Put another way, partisanship has grown much stronger and it is harder to win. Impressively, Hogan managed it with a strong prevailing wind behind him in 2014. But can he repeat the feat in 2016 when the Republicans appear likely to be facing a backlash based on historical trends? More discussion in Part III. Governor Larry Hogan’s action since his election point to one major goal: avoiding the fate of Bob Ehrlich by winning reelection in 2018. His strategy on these points seems relatively clear. However, the 2016 election results may upend his strategy. Today, I look at the path he has pursued so far. Hogan has become the master of making popular moves that, in the end, are nice gestures but do little to reshape state government in a meaningful way. His new mandate that schools begin after Labor Day is a perfect example of this approach. If you look at the state budget as a whole, the difference between what Maryland has done under Gov. Hogan and would have done if Anthony Brown had been elected is small and focused on popular but very small cuts. The reduction in tolls is a perfect example. People love it and see it but it’s practically a rounding error in the state budget. Hogan has much derided the “rain tax” but it’s a federal mandate and sending it back to the counties doesn’t make it disappear, so the impact on Marylanders is less than appears. Gov. Martin O’Malley had the misfortune to govern during the horrendous Bush recession. While the budget will always need further work, he and the General Assembly made the tough deep cuts and righted the ship on pensions. Most interestingly, O’Malley took the unpopular decision to raise the gas tax. So far, despite Hogan’s vehement attacks on it during the campaign, it’s still with us, and Hogan seems very happy to go around the state taking credit for roads and other projects it funds. I am sure that Gov. Hogan and his family wish deeply that he had never been diagnosed with non-Hodgkin’s lymphoma. I am grateful, as are Marylanders, that he is making a great recovery. Indeed, he has been a fine example of the fight against a major illness. The publicity surrounding his brave fight has naturally engendered a great deal of sympathy. While Hogan generally presents a determined and happy face to the world, he doesn’t deal well with criticism. He can get petty and surprisingly touchy in response to it, lashing out negatively in response to even mild disagreements. In short, Larry Hogan has presented a pleasing persona happy to do small things in the wake of the frenetic O’Malley years and enjoy the benefits of previous hard decisions. This approach has resulted in high approval ratings. But will Trump’s election upend Hogan? In a thundering rebuke to Montgomery County’s governing establishment, voters have passed term limits by a 38 point margin with early votes and election day votes counted. Folks, let’s call this what it is. This year will see one of the largest electorates in Montgomery County history. While the absolute number of voters may be declining in our mid-term elections, it has been steadily rising in presidential general elections. County residents voted overwhelmingly for Hillary Clinton over Donald Trump (by 54 points as of this writing). But they also voted for term limits despite the fact that most county voters are Democrats and all county elected officials are Democrats. 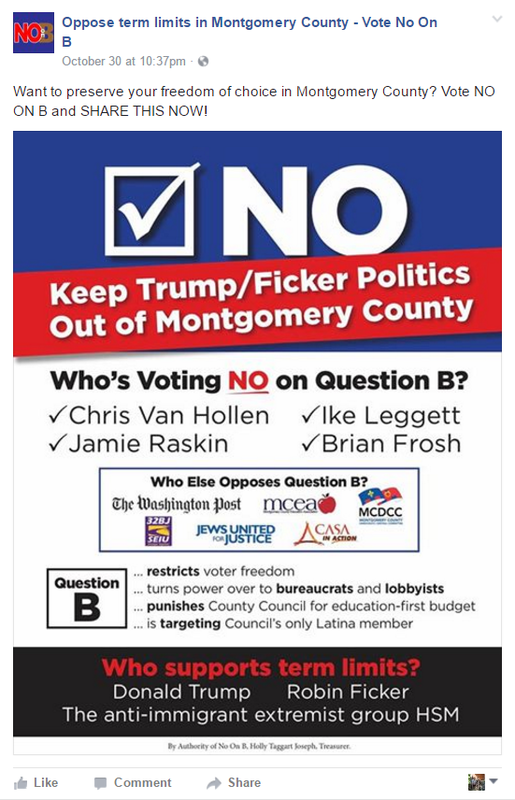 This year was reminiscent of the 2008 general election, during which MoCo voted for Barack Obama by 45 points but also approved Robin Ficker’s charter amendment restricting property tax hikes by just 5,060 votes. This demonstrates the capacity of county voters to keep national issues and local issues separate when they so desire. The big difference between 2008 and now is that the margin of term limits’ passage was so titanic that it’s possible that half of all Democrats voted for it. The scale of this upheaval is virtually unprecedented. Sure, County Council incumbents have been defeated here and there and a sitting County Executive was beaten in 1990. But the voters voted against all the incumbents this year, or at least put an expiration date on their services. To find something comparable, you would have to go back to 1962, when five of seven Council Members were ejected, and 1966, when six Council Members were defeated. Former County Council Member Steve Silverman astutely characterized term limits supporters as “a convergence of strange bed-fellows.” County employees upset about reduced raises, business people unhappy about what they see as an unfriendly business climate, residents opposed to new master plans with more density, Republicans and unaffiliated voters angry about being marginalized, opponents of the county’s liquor monopoly, people upset about the recent Giant Tax Hike and nanny state laws, and those who genuinely regard term limits as facilitating good government came together as they never have before. As David Lublin wrote, these groups may have had incompatible visions of what county government should be, but all of them believed the way to get there was to get rid of the incumbents. Term limits opponents made two primary arguments. 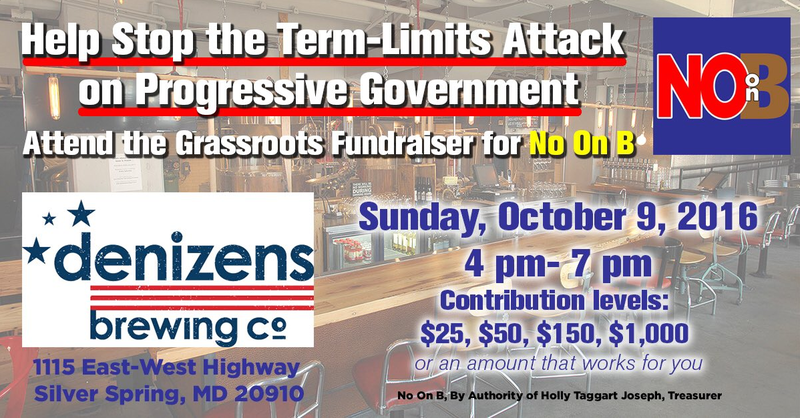 First, they described term limits as “an attack on progressive government.” This had the effect of making the term limits question a referendum on current county elected officials, a perspective actually shared by many supporters. And second, they tried to make term limits toxic by emphasizing their support by figures like Donald Trump, Robin Ficker and Help Save Maryland. That strategy didn’t work for two reasons: the opponents were vastly under-funded as they were going uphill and the message itself was not calibrated for a general electorate that is less liberal than Democratic primary voters. Social media proved to be the weapon of choice for both sides, and in terms of Facebook likes, supporters outgunned opponents by a ratio of 13-1. Opponents were counting on the Democratic sample ballot and the Apple Ballot, both opposing term limits, to win. But whereas the sample ballot is often mailed to all county Democrats, this time around it was mailed only to those who had newly registered. And the teachers union did not supplement its Apple Ballot poll coverage with multiple mass mailings as they do in mid-term years. Accordingly, the impact of both ballots was blunted. Opposition organizer Tom Moore made a valiant effort, but this was an unwinnable campaign from the start. We don’t want more property taxes. We don’t want more government fees. We don’t want a labor union running the police department. And even though most of us are Democrats, we are telling the Democrats who run the county government that twelve years in office is long enough. This is pretty much the opposite of the long-standing posture of the county’s political establishment. And it’s not just coming from flakes, fanatics and fringe types like Robin Ficker and Help Save Maryland – it’s coming from a majority of county voters. If there was ever a moment for the governing class to do some soul searching, this is it. Opponents of term limits may be right about one thing – they may change the names of elected officials, but not the type of them. Democrats, often very liberal ones, will continue to be elected because of our closed primary system. But the combined message of the last four ballot questions imposes a hard choice on the elected officials of today and tomorrow. They can try to balance the interests of various constituencies across the political spectrum at the possible cost of losing the progressive support that influences Democratic primaries. Or they can stay the course and watch more moderate general election voters pass even more restrictive ballot questions, including perhaps the ultimate bane of progressivism – a hard tax cap. 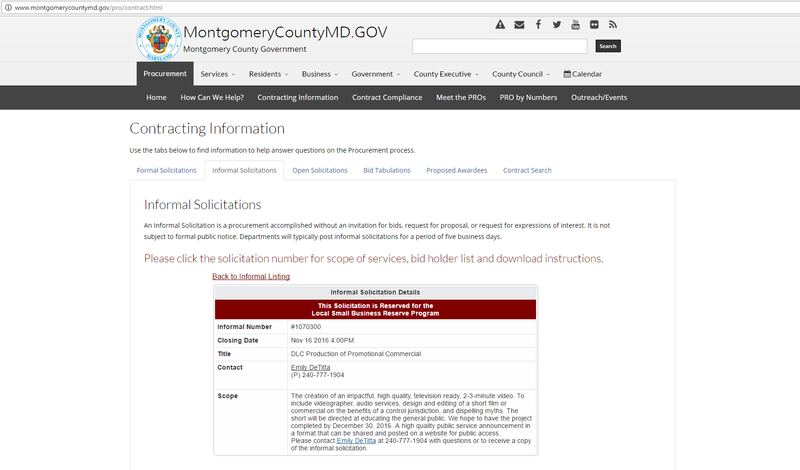 The Montgomery County Government has issued a solicitation seeking bids on a propaganda video defending the county’s liquor monopoly. The solicitation comes after the County Executive’s task force on the issue concluded its meetings with (so far) no apparent resolution. This is not the first time the county has used public resources to spread political propaganda supporting the liquor monopoly. 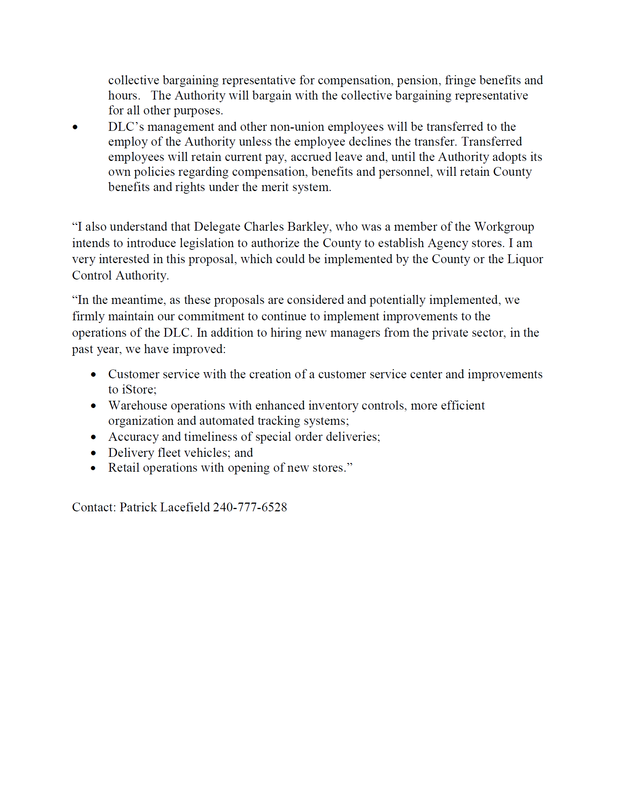 Last January, the county distributed flyers defending DLC at county liquor stores while the county’s state legislators were debating its fate. The flyer distribution ended shortly after it was exposed by Fox 5. The cost of the video will not be known until a bid is accepted, although the solicitation’s fine print states that it cannot exceed $25,000. The cost of distribution could be much more, especially if the county runs the video as an ad on private television channels. All of this comes after the county’s state legislators, who have purview over DLC since it is established in state law, asked the County Executive last year to consider various models of liberalizing the liquor monopoly. The Executive agreed and convened a task force to study various options, but the task force’s three meetings ended without a visible result. With this solicitation, the county appears to be digging in to defend the monopoly despite its massive failures and the protests of thousands of residents against it. The liquor monopoly is one of several reasons why MoCo residents voted for term limits and yet the county is staying the course. Top Line: The Republican coalition in Maryland took a sharp turn toward less educated voters and remains heavily white. The above is a quickly done ordinary least squares (OLS) regression analysis of aggregate support for Trump and the change in the vote from 2012 to 2016 by county. The numbers in parentheses are standard errors around the coefficients shown above them. The coefficients are easy to interpret. For example, the coefficient of .77 on Percent Non-Hispanic White in the model of Percent Trump indicates that 1% increase in the non-Hispanic white population resulted in a .77% increase in the Trump vote. Similarly, an increase of 1% in the share of college graduates reduced the Trump vote by .54%. The second model of the share of the Trump vote in Maryland also includes a control for how counties voted on the MD Dream Act in 2012 as a further control for immigration attitudes. While the results are at the edges of statistical significance, this model indicates that, even after controlling for race and education, that a 1% increase in opposition to the Dream Act resulted in a .67% increase in support for Donald Trump. The third and fourth models assess the impact of the same variables on the net change in the vote from 2012 to 2016. The change in the vote equals (%Trump – %Romney). Educational levels dominate changes in the share of the vote won by the Republican and Democratic nominees. 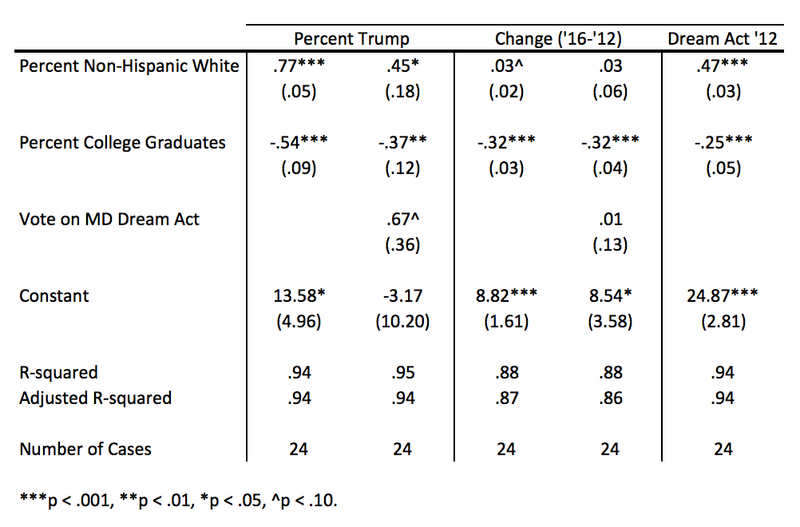 While neither race nor the opposition to the Dream Act matter much, a 1% increase in the share of college graduates resulted in a loss of .32% by Trump. The final model shows the relationship between race and college education to opposition to the Dream Act. It suggests that a similar coalition supported Trump in 2016.